This week started out with me having to go to the dentist for a root canal. It wasn't as painful as I had remembered. I am still recovering from the discomfort and busy with other responsibilities. As I posted my ALYOF goal, I got really motivated to put my Christmas blocks together. I laid out the blocks and worked to determine the color choices for the sashing. In the end I felt white was the best way to go. I have since completed the quilt top and now deciding on the piecing for the backing. I will share my progress as I go along, but for now this is a photo of the blocks sewn onto the sashing. I hope those of you going through the polar vortex is warm, safe and sound. I love your blocks! I think the white was a good choice too. What a sweet Christmasy quilt top! Love the way those pretty fabrics shine against that white background. It's gorgeous! Thanks for sharing this beauty at the Let's Bee Social linky party, Kim! Your christmas blocks are really lovely! Looking forward to seeing the finished top! 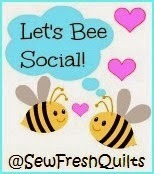 :) Visiting from Sew Fresh Quilts!